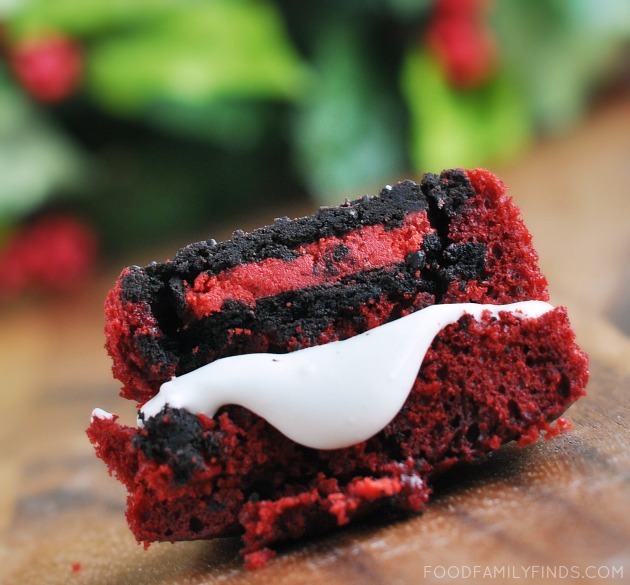 Festive Oreos + cake + a Whoopie Pie like filling = YUM! Family Food & Finds says the original recipe was found on the Oreo recipe website but I wasn’t able to find it when I looked. Even if the red holiday Oreos are not available this season, I think green or white ones would also work. It’s the red velvet cake that really makes these perfect for Christmas. Line two cupcake baking pans with liners and place one OREO with the design facing down into each liner. Pour about 2 tablespoons of cake batter over each cookie. Bake 15 – 20 minutes, until a toothpick entered in the center comes out clean. Set aside to cool. Microwave marshmallow creme for 15 seconds and whisk with COOL WHIP. Remove the cupcakes from the liners and slice in half and put a dollop of the filling between the layers.